Buy 1 oz 2014 Slave Uncle Silver Proof-like Rounds | ?? 1盎司2014年奴隶叔叔半精制银圆 The Slave Uncle round deals with the idea that the power hungry want you, not in the patriotic sacrificing sense that was foremost in the minds of those who answered the call, but rather as something that can be controlled, manipulated and used to further their own ends. This powerful design captures the idea that should have been so great, but has been corrupted, and "skeletonized" to serve their own ends, at the barrel of the gun that Uncle Sam now holds. The obverse features a captivating design by Heidi Wastweet that features the iconic Uncle Sam poster, exposed for its true purpose. 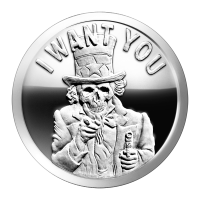 Uncle Sam has his iconic top hat with stars and looks the same, even the words "I Want You" are the same. But something is different. Uncle Sam's face is skeletonized and in his left hand is a gun. The pose is more threatening, almost tyrannical. The reverse shows the revised Silver Shield logo with the trivium in the centre encircled by the words "Silver Shield 1 Troy ounce 2014 999 Pure AG" surrounded by 47 bullets. This design unmasks a powerful symbol.